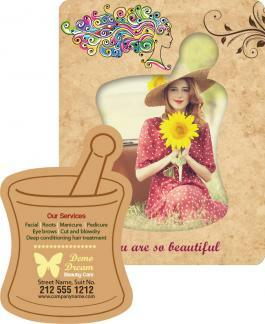 Promotional 3.5 x 4.75 pestle punch full color health magnet is a favored promotional choice for advertisers who are practicing herbalist and alternative medicines. Pestle and mortar is regularly used by herbalists and alternative medicine practitioners to build their credibility because it exudes highly natural appeal. Personalized 3.5 x 4.75 pestle punch full color health magnet will attract quick glances from its place of affixation, thereby making your business information dearer to a viewer. A custom 3.5 x4.75 pestle punch full color health magnet will be treasured because it reminds a user about their treatment or great association with someone who practices a particular form of natural treatment. Product Size : 3.5 in. x 4.75 in.